The best guarantee to prevent sudden and unexpected explosions of tempered glass sheets, due to impurities of Nickel Sulphide in the original float glass sheets. HST oven represents the ideal means to comply with the safety rules concerning the use of tempered glasses. Keraglass HST oven, certified according to the Standards DIN-EN14179-1, allows the user to put on the market a certified product. Keraglass KBFO Bending and Tempering Oven ONE WAY has a superior distinction in the glass shaping system, based on a press-molding group. 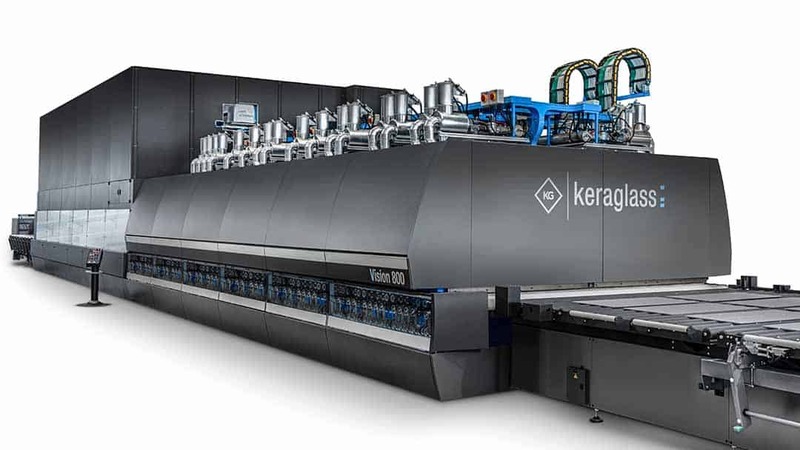 Keraglass KBFO Bending and Tempering Oven TWO WAYS has a superior distinction in the glass shaping system, based on a press-molding group. This allows processing cylindrical bending as well as spherical bending, with absolute precision and repeatability. Vision 800 is an oscillating tempering furnace equipped with a high efficiency convection system on the top and on the bottom of the glass, based on a high pressure blowing system inside the heating chamber with preheating air system at 700 ° C.
Several installations around the world confirm the great success of this furnace, capable to achieve the best quality of the latest generation of LOW-E glass e = 0.01. Vision 900 is the super innovative tempering furnace for flat glass. Equipped with a PRE-HEATING convective chamber, it has been validated and certified by STAZIONE SPERIMENTALE DEL VETRO, matching all the requirements of UNI standards.